By popular demand, the first book to be published by River Greta Writer, ‘Ivver Sen’, is now available in paperback. Keith Richardson's award-winning book about Lakeland shepherds, with pastel drawings by the artist Keith Bowen and photography by Val Corbett, is now on sale for £20 at book shops in Cumbria and through this website. LAKE DISTRICT: The life and times of the men and women who work the land. By Keith Richardson. Pastel drawings by Keith Bowen. You can buy a book or books direct from River Greta Writer. Simply telephone (017687) 74284 or e-mail keithr@rivergretawriter.co.uk to make your order. If you get the answer phone, don't worry, Keith will return your call. The book (copies are autographed) retails at £20 and there is a charge of £7.90 for postage in the UK. Cheques or postal orders should be made payable to 'River Greta Writer.' All books are posted out in a specially protected package to avoid any damage in transit. (Please call or e-mail Keith Richardson directly for postage costs overseas). In addition to the above method of direct sales, River Greta Writer offers other ways of ordering / payment. You can purchase 'Ivver Sen' through Google Checkout or an e-mail order form or a postal order form (see below). And then, of course, the book is stocked by a number of bookshops and other outlets in Cumbria and the Lake District. 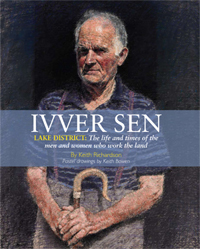 The book Ivver Sen is now available at a number of book shops and other outlets in Cumbria, as well as direct from the author / publisher via this website. The Keswick Reminder, Station Street, Keswick. Bookends bookshop, Main Street, Keswick & 56 Castle St, Carlisle. Michael Moons Bookshop, 19 Lowther Street, Whitehaven. Fred Holdsworth Bookshop, Central Buildings, Ambleside. The New Bookshop and Coffee Shop, 42/44 Main Street, Cockermouth. Sam Read's Bookshop, Broadgate House, Grasmere. Just for Ewe, Fairfield House, Coniston. Suttons Book Shop, 48 Market Street, Ulverston. Treeby and Bolton, Lake Road, Keswick. Viridian Gallery, St John's Street, Keswick. Waterstones, Kendal, Barrow in Furness and Carlisle. PayPal is as you probably already know, fast, secure and hassle-free. Perhaps you do not want to Sign-Up for a Google Account but you still want to order your book on-line? Then you can very simply fill-out our on-line order form and email your details directly to River Greta Writer. We will then process your order. N.B. Please remember that you will still need to post a cheque or postal order to River Greta Writer before we process and ship your order. Unhappy about buying on-line? Don't worry, we at River Greta Writer are comfortable with customers who prefer to pay by more traditional means. Simply print out and fill in the pdf document from the link below, plus send a cheque or postal order to 'River Greta Writer', and we will gladly send your order to you. If you have any problems or any further questions, please contact Keith Richardson on 017687 74284 or email keithr@rivergretawriter.co.uk.